This colorful side dish provides lots of flavor with either potatoes or squash. 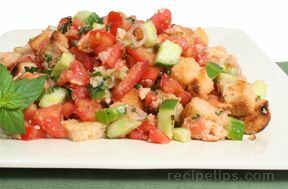 It is a great dish in which to use your end of the summer vegetables. Melt butter in skillet oven medium heat. Add garlic, thyme, herbs de provence and the bread cubes. Transfer bread to a baking sheet and sprinkle with salt and pepper. Toss again. Bake, stirring occasionally with a wide spatula, scraping across the bottom so that the cheese and seasonings don't stick and burn. Soak sliced onion in vinegar and a pinch of salt for at least 15 minutes. This is called blooming the onion, which mellows it's flavor. 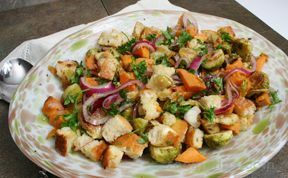 Toss sweet potatoes with 2 tablespoons of olive oil, sage, salt and pepper and Brussels sprouts. Into the onions, pour 1/2 cup of olive oil and season with pepper. 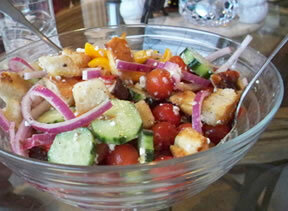 If not serving the salad right away, this can be kept in a separate container and refrigerated until ready to serve. In a large bowl, combine the potatoes, Brussels and croutons. Add onion vinaigrette and toss. 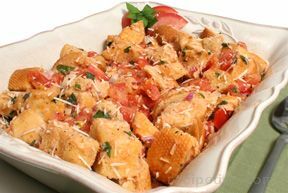 Garnish with more grated parmesan cheese and serve.